Apple’s iPhone is a product that’s been years in the making. Apple’s designers have been working on it for years, and the Web has been buzzing about Apple’s entry into the phone market for just as long—or maybe even longer. But now, after six months of intense speculation since its introduction at Macworld Expo, the iPhone has arrived. Although the iPhone is not without a few quirks, it makes good on the hype that surrounded it. Steve Jobs proudly described the iPod as a beautiful piece of hardware that had amazing software inside it. And with the iPhone, Apple’s hardware designers have once again wrapped the output of the company’s in-house developers into a remarkable piece of hardware. Pictures of the iPhone don’t do it justice: it’s smaller than it looks. Roughly the width (2.4 inches) and height (4.5 inches) of a full-size iPod, depth is the dimension that makes the iPhone feel tiny: it’s shockingly thin, measuring less than half an inch. However, the iPhone doesn’t feel fragile. It’s got enough weight (4.8 ounces) to it to feel substantial when it’s in the palm of your hand. And the iPhone appears to be built to last, with a screen that proved quite resistant to scratches and drops. 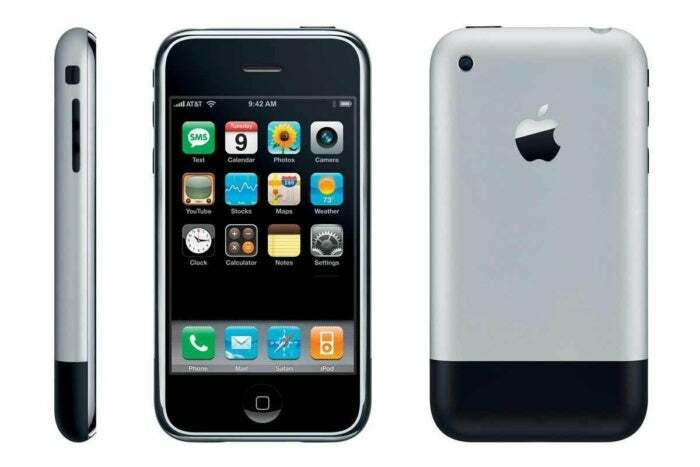 The iPhone’s back side is a textured silver, rather than the polished stainless steel of the full-sized iPod models, so my guess is that both the front and back of the iPhone will be more resistant to scratches than either the full-sized iPod or the original iPod nano. This is not to say that the iPhone is impervious to being marked up. Perhaps we were unwise to order pizza at Macworld on the day of the iPhone’s arrival, but the grease from that pizza helped make a point: the iPhone’s screen collects fingerprints. The good news is, the screen’s so bright that in most situations you don’t notice the fingerprints. But it’s enough of an issue that Apple includes a small black chamois cloth in the iPhone box, and the image-conscious iPhone owner will want to give their screen a good wipe-down often. The dominant physical feature of the iPhone is its black glass face, punctuated by a single physical button on the bottom and a speaker slit near the top for listening to phone calls. But the Home button isn’t the only physical button to be found anywhere on the iPhone; on its side are a pair of volume buttons, which (depending on context) will let you raise or lower the volume of the phone’s ringer, music or video playback, or conference-call speakerphone. Placed right above these two buttons is a switch that slides back and forth; in one position the iPhone will emit sound from its external speaker, while in the other it will only vibrate to warn you that something’s going on. Using a switch instead of a toggle button was an excellent choice, since you can feel the switch’s position even in a darkened movie theater. However, the volume buttons are located a bit too close to the switch, and on several occasions I found myself pushing the switch (which won’t budge) in a vain attempt to boost the iPhone’s volume. The iPhone’s top has a physical button, too. It serves as a wake/sleep toggle button: press it and the iPhone goes to sleep and locks instantaneously. (This feature is aimed at preventing you from accidentally pushing an on-screen button; you can still receive incoming calls when the phone’s in this state.) Press that same button and hold for a few seconds, and the iPhone will shut down completely. The iPhone comes with a set of stereo earbuds that sound pretty good, exponentially better than the earbuds that shipped with the original iPod. These earbuds also include an inline microphone that’s also a clicker: click once to pause or play your music, or click twice to advance to the next track. Although I’m sure that third-party headphone makers will create numerous excellent alternatives, the good news is that the iPhone’s in-the-box earbuds are very good. The iPhone’s inside may not be as beautiful as the outside, but it’s full featured. Each iPhone contains either 4GB or 8GB of flash data storage. It’s also got three different wireless technologies inside: a standard GSM cellular connection with support for AT&T’s EDGE network, support for 802.11b/g Wi-Fi networks, and Bluetooth. The iPhone’s display is excellent. Yes, it’s big and bright, but its most impressive trait is its high resolution: It’s 160 dpi, more than twice the traditional Mac screen resolution. Jamming that many pixels together in such a small space means that everything on screen looks smooth, not pixelated. Digital photos and videos look gorgeous, and even the colorful icons on the iPhone’s home screen are so bright and clear that sometimes it’s hard to believe that you’re looking at a computer screen and not something physical, like a sticker. On-screen text looks sharp, more like printed text in a book or magazine than drawn with pixels on the screen. Of course, the iPhone’s screen isn’t just for looking at: It’s the key driver in the device’s interface. Using the iPhone is a tactile experience—it’s all about touching your fingers (or, if you’re daring, your thumbs) to that screen. Instead of dragging a scroll bar or clicking a mouse, you move through screens on the iPhone by a combination of taps, flicks, and other finger gestures. The original Macintosh changed the world by providing a physical control to move a cursor around on a computer interface. But the iPhone does it one better—instead of pushing around a mouse in order to make a disembodied arrow or hand move up on the computer screen, it’s your finger doing all the moving. When you touch a photo, Web page, or email message on the iPhone and slide with your finger, it moves along with your touch, as if you were moving a real, physical object. There’s no cursor on the iPhone because your finger is your pointer—which, despite what your mother might have told you, is just what fingers are designed to do. If pointing is a natural act, typing on a keyboard (especially a tiny one) is its antithesis, but it’s a necessity of our modern age. After the crash-and-burn of the Newton’s handwriting-recognition interface and even Palm’s original Graffiti writing system, the makers of most mobile devices settled on tiny, chiclet-style keyboards as the best way for people to input text. The iPhone’s designers seem to agree that typing is the best way to enter data on a small device, but they’ve ditched the physical keyboard and replaced it with more touchscreen space. When you’re using the iPhone and reach a point where you need to input text, a keyboard automatically slides up from the bottom of the screen. The abolition of a physical keyboard is probably destined to be the iPhone’s most controversial feature, at least at first. There’s a bit of a learning curve when it comes to using the iPhone’s keyboard, especially for people who are comfortable using the physical keyboard on a Blackberry, Treo, or other smart phone. I can’t say that my typing experience with my previous phone, a Palm Treo, was particularly good. I could manage, but never felt that I could reach an acceptable typing speed. As a result, it’s hard for me to put myself in the place of an accomplished Blackberry thumb typist who has spent a year honing his or her skills. But I believe that most users—even thumb typists, given an open mind and some training time—will find the iPhone’s keyboard to be excellent. It does take some getting used to, however. That’s because the iPhone’s keyboard is a failure if taken literally. If you slowly tap every single letter and painstakingly backspace if you press the wrong one, you will never be satisfied. The iPhone’s keyboard excels when you ignore your mistakes and keep on typing, because it senses your finger presses, compares all the nearby keys to its built-in dictionary, and intuits what you’re actually trying to type. Over time, as it learns the kinds of words you type, it improves its auto-correcting accuracy. Within a few hours with the iPhone, my finger was flying over the keyboard, and I’m sure my fingertip was only getting roughly close to the correct letter most of the time. But the iPhone’s software, with remarkable consistency, knew what I had meant to type. I assume that with some practice, two-thumb typing would be even faster, but with my index finger I managed to type faster than I ever have on a tiny device, physical keyboard or not. The iPhone’s key layout is smart, too: it changes what keys appear depending on context. For example, in Safari’s URL window, you’ll be presented with a .com key. In an email window, you’ll only be provided with characters that can be part of a valid email address. One inconsistency is the presence of a horizontal keyboard when the iPhone is in a landscape orientation: it shows up in Safari, but it would be nice if you could rotate other applications, such as Mail, in order to take advantage of a larger keyboard. One iPhone text oddity is that the device has no concept of a text selection, let alone copy, cut, or paste. You might think that touching your finger and dragging it across text might select it, but it doesn’t—Apple uses that gesture to bring up a magnifying glass so that you can correctly reposition the insertion point (which is a great idea). Without copy and paste, you can’t (for example) compose a blog entry in the notepad while in Airplane mode and then paste it into your blog-posting tool in Safari when you’re back on the ground. Yes, you can email that note, and if your blog tool has an email-to-blog gateway, that’ll do in a pinch, but the lack of a better way to transfer text from one place to another can generally hamper interaction between different iPhone programs. It’s easy to get lost in the hype about touchscreens and Web browsers and forget that the iPhone is, like its name says, a phone. And it works pretty well as one: When an incoming call arrives, the iPhone gently interrupts what you’re doing to display Caller ID information about who’s calling. You can set any of 25 built-in ringtones as your ring and assign custom ringtones to individual callers. Unfortunately, you can’t use your own music or sounds as ringtones. Once a call is in progress, the iPhone’s large screen gives Apple room to make it clear what your options are while on the phone, including placing people on hold and creating conference calls. The iPhone uses iTunes to sync the contents of your Mac’s address book (or a set of groups within the address book) with its internal contacts list. Although I was initially resistant to the idea of syncing over all my contacts rather than just a group containing the people I was most likely to call, in the end, syncing everything is probably the best approach, since your contacts are also used for email addressing. In fact, the stickiness of your current contact group is just one example of an effect you’ll find throughout the iPhone’s interface: When you return to a task you were previously using, things will generally be just as you left it. For example, if you’re looking at a Mail message and then press the Home button to check stock quotes, when you tap on Mail again you’ll be back to that same message. The iPhone’s Phone application is a five-tabbed interface that lets you quickly get to a numeric keypad for “old school” dialing (especially useful if you’re trapped in a phone tree), see your contacts, and get a list of recent calls.